Would you be interested in using the grid to update https://public.opencpu.org/ocpu/github/qitools/charts/www/ ? The last update of qcc stopped allowing overlay regions and lines for targets in the setting of a trial. I really like what you have done, but I ran into a problem. Here is a reproducible version. Thank you,Todd. I just noticed this the other day, myself. What version of ggplot2 are you using? 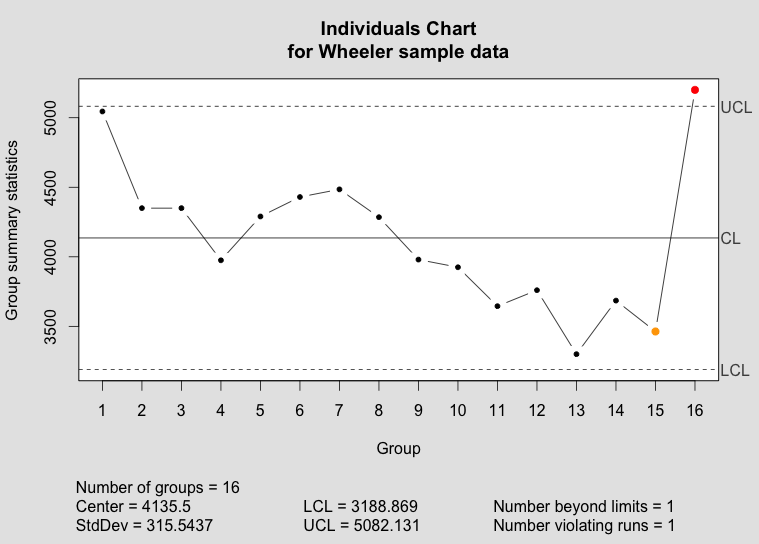 How do you use qcc or your ggplot2-compatible version to draw an XmR-chart with both the individuals-chart and the corresponding range-chart combined? I only managed to plot a single chart using qcc, not a compound XmR-chart as suggested by Don Wheeler. Any hints how to achieve this in R? Using my ggplot2-based version of qcc.plot, you can use the package egg (available on GitHub via the devtools package), or grid, or gridExtra to combine the two into a single graph object. Apologies for the delay in responding; I missed WordPress’s notification. At first I thought it was because line 643 used env=getNamespace instead of envir=getNamespace. And indeed the error went away when I made that change. But once I saved the file, the error showed up again. Any ideas on what I should change? Ross, before sourcing my code, did you load the qcc package with “library(qcc)” or “require(qcc)”? And currently, I am getting this error while using your function. 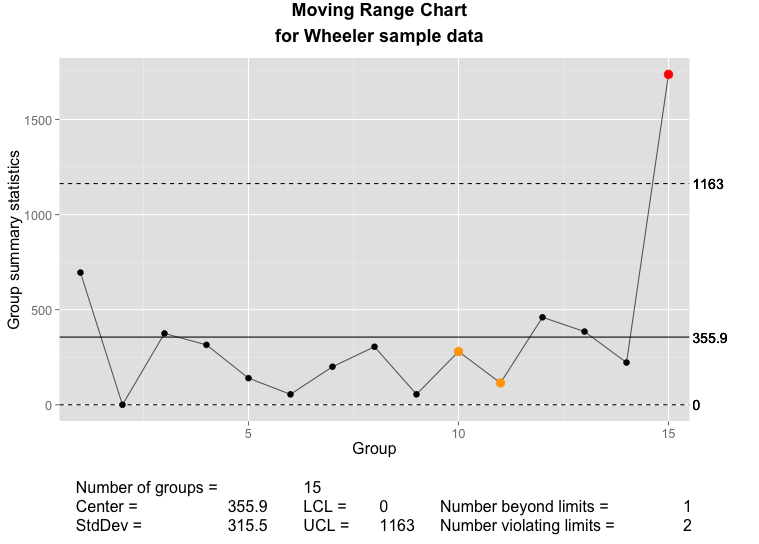 Plotting individuals and moving range together on one plot area is why I re-wrote plot.qcc(). However, for backward compatibility with qcc(), there is no built-in option to do this. 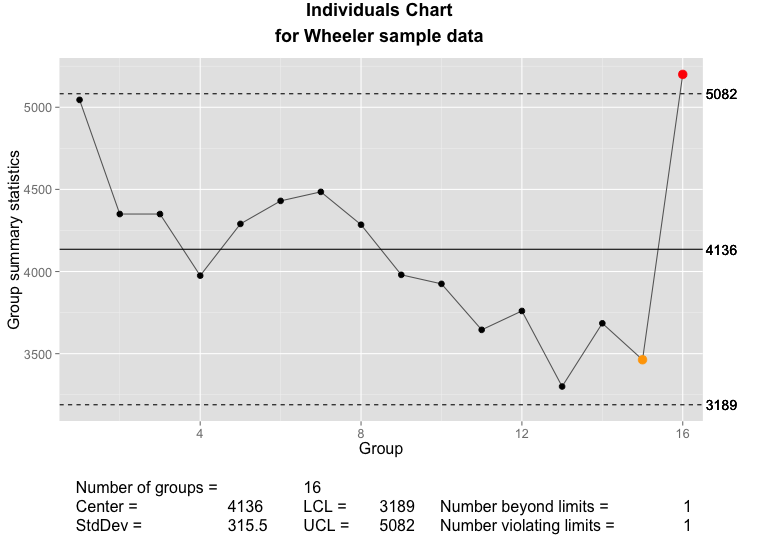 You’ll need to do it either by using library(grid) and plot the qcc objects to viewports that you set up, or you’ll want to try to use functions for arranging ggplot2 plots, such as in cowplot or ggpubr. Regarding the error…it looks like a change in R is causing an intermittent problem with assignInNamespace(). I’ll work on a permanent solution, but until I can update the code, try source() again, or read in the code (e.g. open the qcc.plot.R file and execute the code with the “run” command). It seems to sometimes throw an error, and sometimes work.